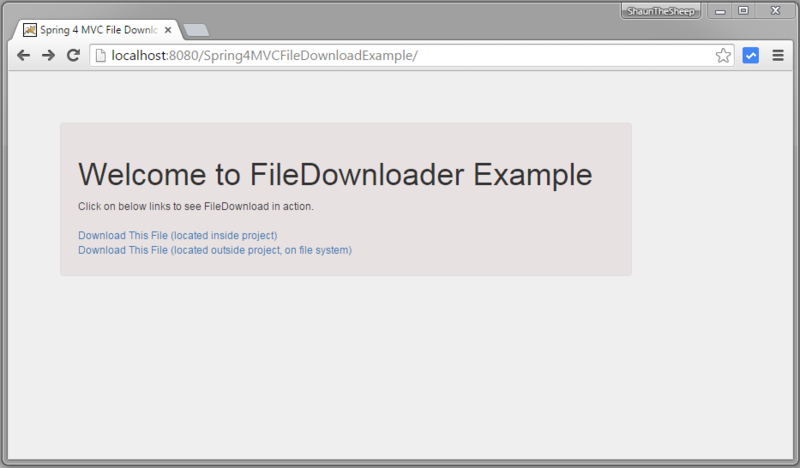 This post shows you how to implement File Download using Spring MVC 4. We will see file download for file internal to application as well external file from file system. Let’s get going. Downloading a file is quite simple and involves following steps. Create an InputStream to the file to be downloaded. Find MIME type of the content of downloaded file. – can be of application/pdf, text/html,application/xml,image/png, ..others. Set Content-Type in response(HttpServletResponse) with MIME type found above. 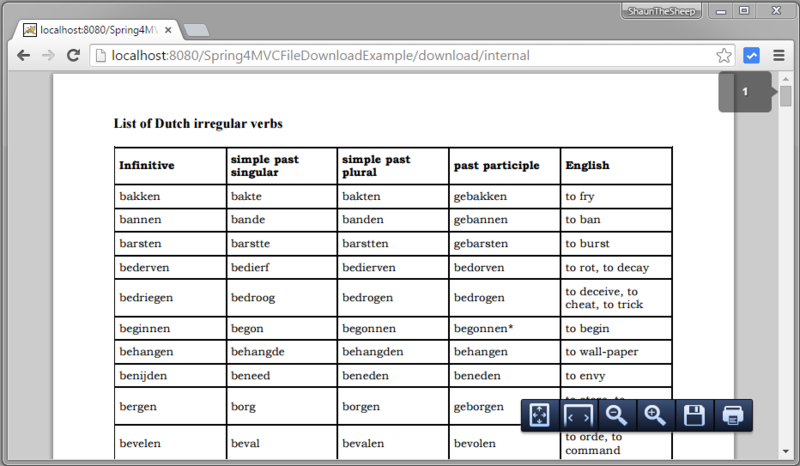 Set Content length in response with MIME type found above. Set Content-Disposition HEADER in response. response.setHeader(“Content-Disposition”, “attachment; filename=” + fileName); //With ‘attachement’ File will be downloaded as is. May show a ‘Save as’ dialog based on browser setting. response.setHeader(“Content-Disposition”, “inline; filename=” + fileName);//With ‘inline’ browser will try to display content right into broswer for certain contents(imgages,PDF,text,..). For other content types, file will be download directly. Copy bytes from InputStream to OutputStream of response. Once copying done, close input & output stream. Complete Example is discussed below. *   - inside project, located in resources folder. *   - outside project, located in File system somewhere. //Copy bytes from source to destination(outputstream in this example), closes both streams. This Controller involves two files. 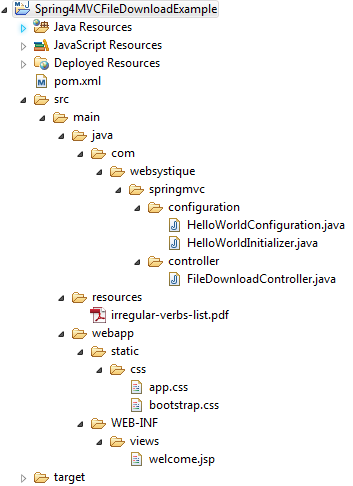 One file is internal to application (inside resources), and other file is located on file system external to application. Be sure to change external file path for your project. Only for demonstration purpose, we have included an extra path variable(internal/external) in path. We are using Spring FileCopyUtils utility class to copy stream from source to destination. Now build the war (either by eclipse as was mentioned in previous tutorials) or via maven command line( mvn clean install). Deploy the war to a Servlet 3.0 container . Since here i am using Tomcat, i will simply put this war file into tomcat webapps folder and click on start.bat inside tomcat/bin directory. Clink on Second link. External file should be downloaded. Clink on First link. Internal file [which is a PDF] should be displayed in browser, thanks to Content-Disposition: inline.With inline, if the content can be shown by browser, it will show it in browser. Now change Content-Disposition from inline to attachment. Build & redeploy. Click on First link.You should see that pdf file is downloaded this time. That’s it. 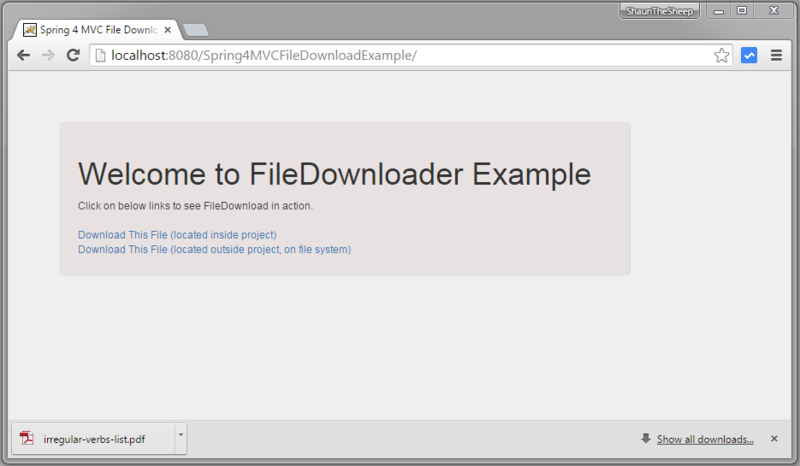 Next post shows File upload-download a file into database using Spring MVC 4 , Hibernate and MySQL.